One of the best hip-hop rappers I have had the pleasure of hearing lately is a hot rap artist out of Cali named Lil’ Al. Nothing is better than some new head bobbin’ west coast gangsta music from a straight shooting west coast rap artist who is coming strong; Latin stylings mixed with heavy SoCal beats and you have Lil’ Al. Born and raised in San Diego, California, Lii’ Al is the West Coast’s newest intense rising rapper. With his smash single “Crackin In The Club”, this up and coming gangsta rap artist is already making noise in the hip-hop community. Tracks for everyone from the street thug, to the club hoochie, to the dance floor shakers; Lil Al delivers fresh beats and strong lyrical flow. 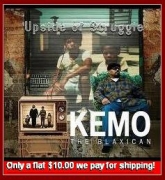 His first album, ‘Hood Raised’ to be released on SMC Recordings/Universal has a street date of Febuary 06.The album features platinum production and top—notch hip-hop rap artists such as Kokane and KMG from Above The Law. Lii Al’ discovered his musical talent at an early age, an avid listener of classic soul and old school music, Lii’ Al took inspiration from his favorite songs and began to freestyle rap. He burst onto the scene in 1995, writing music and creating his own underground mix tapes. In 2001, Lii’ Al made his debut on Mr. Shadow’s compilation, ‘Street Thuggz’. In addition to being a hip-hop rap MC, Lii’ AL is proving himself to be a fearsome businessman. In 2005 Lii’ Al partnered up with long time friend Jose D and formed HoodRaised Entertainment. HoodRaised is an independent record company focused on building and promoting Latin hip hop. With drive and determination, these two young entrepreneurs have focused on making radio hits. The first single “Crackin In The Club” is produced by multi—platinum producer D-Black and Chris Gunn, and provides a smooth Latin sound that will spice up the airwaves. If you sleep on this one ya don’t know gangsta. The Self Made L.P. is a banging record and truly needs to be recognized and supported. You owe it to yourself to check this one.